12 April 2019 12:11 PM . Education is the process of enabling your child to not only develop knowledge and skills, but to also acquire beliefs, habits and values. Education encompasses all experiences encountered that have a formative effect on the way your child thinks, feels or acts, and the school years in the life of a child can be the most influential. At Aitken College, education is about teaching skills to be life-long learners. We aim to positively influence your child’s personal development, promoting autonomy and helping them acquire skills to establish them in a career or occupation. We encourage our students to develop a love of learning, embrace a wide academic curriculum including the ever-changing technologies creeping into our lives today, as well as developing and nurturing relationships with family and friends which can have a huge impact on their ability to flourish. 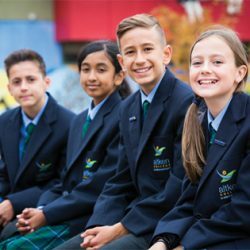 Aitken College is a Prep to Year 12 school, divided into four mini-schools for age-appropriate pastoral care. The primary years include an emphasis on literacy and numeracy, complemented by specialist programs in languages, visual arts, performing arts, physical education and technology. Weekly library programs encourage a love of reading and iPads in each classroom enable students to embrace the learning and creative opportunities offered by the latest educational technology. The Stephanie Alexander Kitchen Garden Program enables primary children to harvest vegetables they have grown in the College’s farm area and use them to make nutritious meals. The children also love to visit the chickens, goats and sheep. Aitken College is able to expose children to participation in events such as sports carnivals, musical recitals and performances, leadership programs, camp experiences, performing arts, language classes, library activities, agricultural and horticultural programs, food technology, and Chapel services. This ensures that students are exposed to a rich and varied curriculum full of powerful learning experiences, providing amazing opportunities beyond the academic curriculum to grow and develop in many ways. Aitken students benefit from some of the most up to date facilities and resources available. Students’ creativity is supported with modern tools such as computer aided design (CAD) and 3D printing. In Digital Technology, students construct robots and use computer coding to make their solutions work. All areas of Technology encourage creative thinking that develops adaptable skills for the future. Aitken College has invested in up-to-date technology in areas such as Media, Theatre Production (sound and lighting) and Music Technology. Students have access to industry standard equipment and software which enables them to exercise their creativity and develop products that can be showcased to an audience. Every school is made up of students with a wide range of abilities and learning styles. Our Learning Centre staff support students with individual learning needs through in-class support and small withdrawal groups. Students with extra ability benefit from a wide range of extension program opportunities. It is very rare for any community to exist in a vacuum with respect to belief in God or some transcendent power. Belief informs culture, values, ethics and morality; so it is not unsurprising to find Religion and Values Education (RVE) at the heart of the Aitken experience. Students from Prep to Year 10 participate in RVE and all attend a weekly Chapel service. Many primary school parents also enjoy attending their child’s Chapel service. Sometimes when I am asked what I do and I respond that I am a teacher, it usually follows with a question such as, ‘What do you teach?’ My response to the question is that I teach young people. Sometimes, I teach them Chemistry, Science, Maths or Technology but more importantly it is about teaching skills to be life-long learners, teaching about self and formulating a set of values through which they can make wise choices and decisions in order to make positive contributions to society. Quality teaching and learning at Aitken College encompasses the academic, the social and the emotional learning that provides for a holistic education. Our College motto ‘In Mind and Spirit’ describes our approach to education. The ‘mind’ reflects the academic facet of all we do and the ‘spirit’ the acquisition of values in the context of the Christian faith.